After a car accident in which her passenger, Marissa, dies, June Parker finds herself in possession of a list Marissa has written: “20 Things to Do by My 25th Birthday.” The tasks range from inspiring (run a 5K) to daring (go braless) to near-impossible (change someone’s life). To assuage her guilt, June races to achieve each goal herself before the deadline, learning more about her own life than she ever bargained for. JILL SMOLINSKI is a transplanted Midwesterner who currently lives in Southern California with her son. She is the author of Flip-Flopped. "Clever and winning, Smolinski’s novel will have readers rooting for June as they eagerly turn the pages to keep up with her progress on the list." "Smolinski crafts a believable heroine, and her chipper carpe-diem message may have readers devising their own Top 20s. . . . Sweet." "Cheers for Jill Smolinski, who has transcended the chick lit category by giving us a heroine who really tries to make a difference in this world. What a concept! I loved this book- its humor and its humanity. You will, too." 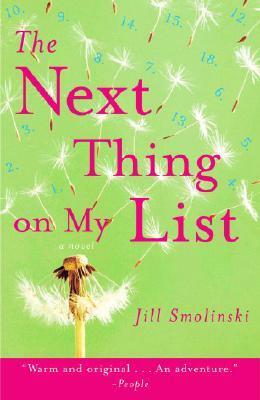 "Instantly engaging, original, and funny, Jill Smolinski's new novel charmed me from the first page. Put this on your list: you won't be sorry!"